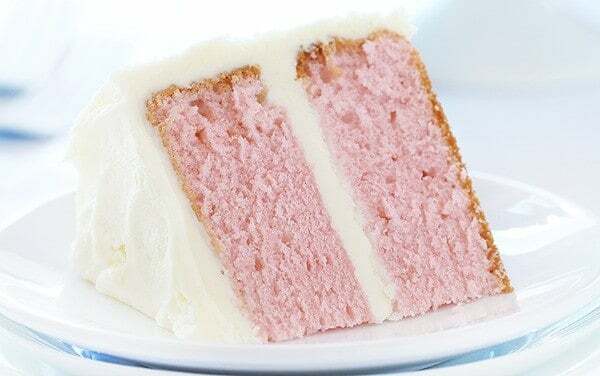 Pink Velvet Cake is seriously so delish! Try it next time you have a sweet craving and want to bake up something special! 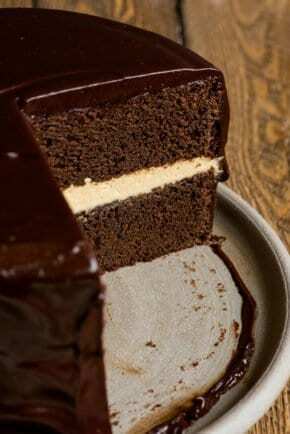 I think most cakes that call themselves “velvet” contain baking soda, buttermilk, and vinegar. 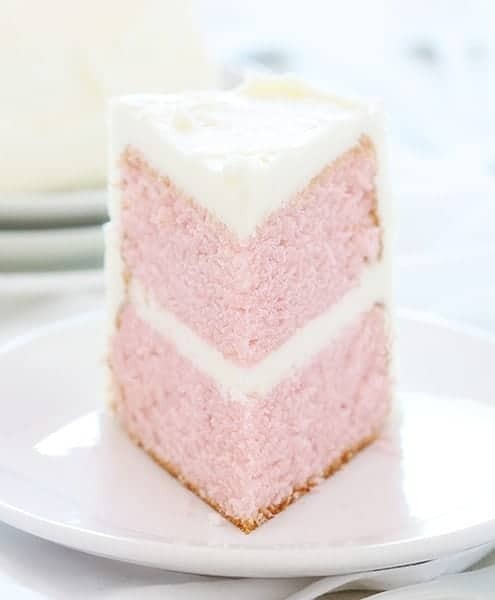 This Pink Velvet cake contains none of those. But it is pink. So please indulge a bit of “descriptive” recipe labeling. I truly believe that the texture of the smooth crumb is enough to grab that “velvet” name and run with it! After making some pink velvet cupcakes with Whipped Buttercream this week I was immediately inspired to turn the recipe into a cake. 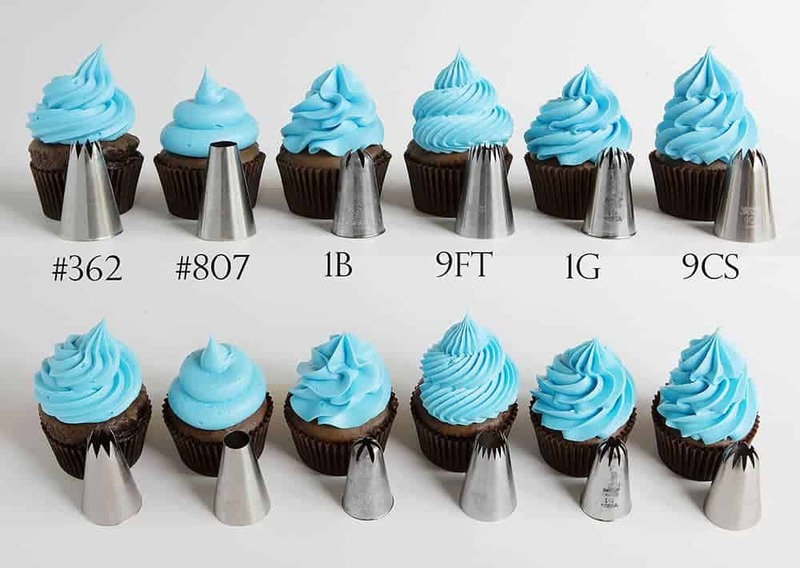 PRO TIP: Here is how to have the PERFECT CAKE every single time… I have found that measuring out eggs makes a HUGE difference in baking. It never ceases to amazing me just how much a little egg can impact a recipe! The difference in egg sizes and yolk sizes can mean the difference between a moist cake and a dry cake. Look for recipes that offer up a volume instead of a size. 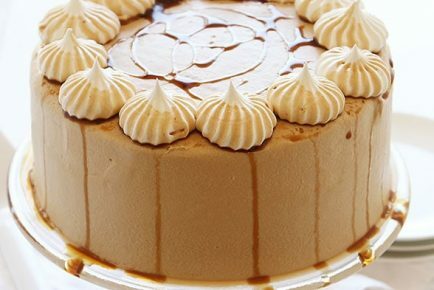 If you are making this cake in advance, try adding Simple Syrup to make sure the cake stays perfectly moist and delicious! To get the “rustic” frosting pattern I simply made a “c” swoop in the frosting and then repeated over the whole cake. 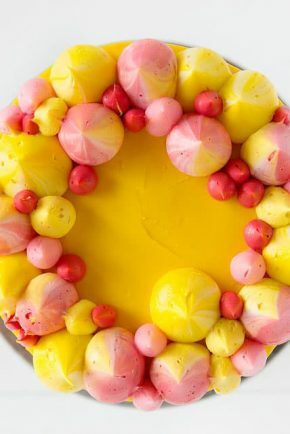 This delicious and pretty cake is just perfect for so many occasions! In the bowl of a stand mixer fitted with the whisk attachment, combine together flour, sugar, baking powder, and salt. Add in milk, butter, extracts, and food color and whisk on low until ingredients are mostly incorporated. Add in egg whites last and mix until incorporated. Divide batter between prepared cake pans and bake for 25-35 minutes, or until a toothpick is inserted and comes out mostly clean, just not wet. Cool before assembling the cake. Made this cake today.did not turn put like the video. It was like I was missing liquidd. Me too…first ever failed cake recipe for me, and I’ve made a few! The batter is SO thick. I just tried it again and don’t have a great feeling about how it’ll turn out. They show a liquid in the video after the milk that is not in the recipe unless that liquid is the egg whites that the directions say to add last. But the liquid after the milk looks like lemon juice to me or egg whites with water added to them. How much Simple syrup and when? I think instructions need to be revised. Hello!how much time before an event i can bake and frost it?thank you! 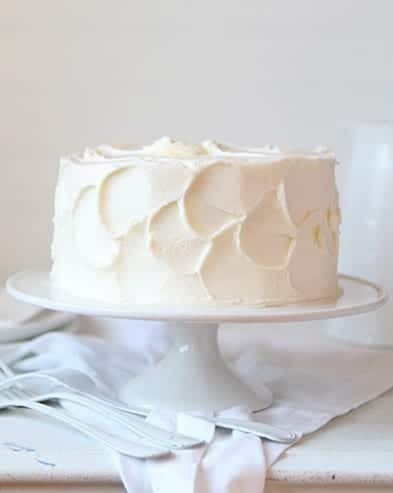 You can bake it well in advance, just freeze the cake layers individually, wrap cooled cake in plastic wrap, then place in air-proof container or plastic bag. (or foil) When ready to assemble, allow cakes to come to room temperature, frost, and place in refrigerator for about 24 hours. 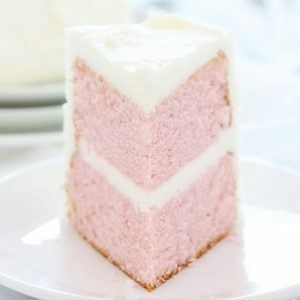 What frosting for pink velvet ?? It looks delicious. I’ll have to make it. Thank you for the receipy. Hello…i would like to make this as cupcakes. Is there a recipe for pink velvet cupcakes or any special modification of this recipe? Thanks! Wondering if this cake is firm enough to be used for a barrel cake which is four 6 inch layers. A cake board will be used between the bottom 2 and top 2 layers, and bubble straws in bottom 2 layers for support. Thank you. So if you watch the video and read the directions they don’t match. In the video it shows the butter, milk, and what looks like lemon juice but I guess is the egg whites(since it doesn’t say, then almond extract, vanilla extract, and red food coloring being added in that order. In the direction it says to add the egg whites last. So ???? What is the liquid that was poured in after the milk? 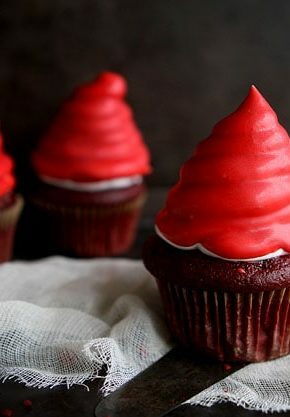 What is the recipe for the icing? Directions say “two 6-inch round cake pans” is that correct? Seems small. Will this work in a 9 x 13 cake pan? How much simply syrup do you use? And how do you make simple syrup? Ok I tried to make this cake tonight and it didn’t turn out. If you add simple syrup how much would you add? I was really bummed I was suppose to take it in for a carry in. Please let us know what that liquid was in the video was that the simple syrup? Was you suppose to make the egg whites stiff or just add? Help!!! I followed this to the T. I feel like the flour taste is over-powering and the cake is dry. My batter was very thick. 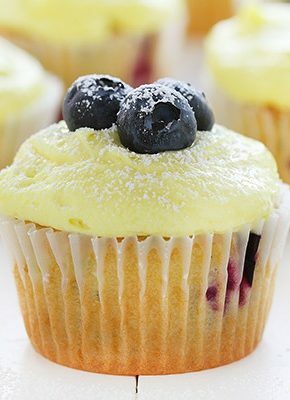 What can I add to cupcakes to make them more moist and less flower tasting? This cake was not nice at all. Even my four years niece begged me not to me that cake for her birthday! Do not attempt.